Tāngata Ngāi Tahu: People of Ngāi Tahu. Volume One is a new book celebrating the rich and diverse lives of fifty people of Ngāi Tahu. It was published by Te Rūnanga o Ngāi Tahu and Bridget Williams Books in late 2017, and released to coincide with the twentieth anniversary of the Ngāi Tahu Claims Settlement. This WORD session was hosted by David Higgins, Upoko of Moeraki Rūnanga, with kōrero by the book’s editors Helen Brown (Ngāi Tahu) and Takerei Norton (Ngāi Tahu), and by book contributors Robyn Walsh (Ngāi Tahu) and Mike Stevens (Ngāi Tahu). The book emerged from the work of the Ngāi Tahu Archives team on Kā Huru Manu, the amazing Ngāi Tahu digital atlas. While collecting and recording places names around Te Waipounamu, the research team realised they were also discovering the names and stories of people who were the very heart of Ngāi Tahu whakapapa. This book is intended to be the first of a series born out of the work of the atlas, and a second volume is already in process. 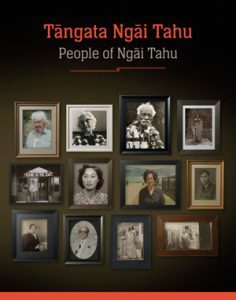 The individual biographies in Tāngata Ngāi Tahu cover 200 years of Ngāi Tahu whānau history, producing a ‘tribal family album’ of stories and images. Editor Helen Brown talked about how among the stories of the ordinary, often household names in te iwi, have been revealed the extraordinary lives of so many Ngāi Tahu people. 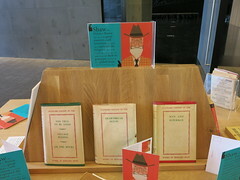 The book has been arranged by person/name, which Helen said gives a more nuanced history than a book based on themes or a more traditional history book arrangement, perhaps in alphabetical or chronological order. The order of the book does invoke a back-and-forth journey across time, with people from the 1800s to more recent times spread at random throughout the book. The effect embraces serendipity, with a mix of stunning, historical black-and-white photographs between more modern colour images drawing the reader into the rich history within. Each biography had a limit of 1000 words, and editing to this limit Helen described as often excruciating. “Whole books are needed,” she said. Perhaps for individual whānau this book will plant the seed to pick up the stories and expand on them for their own tīpuna? 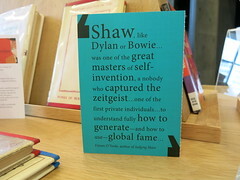 The biographies have been written by a team of writers, whose writing experience in this context Helen described as ranging from gathering the purely anecdotal to more academic pursuits. 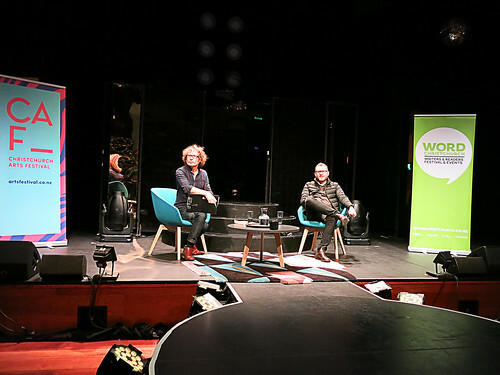 We were lucky to have some of the writers present in the team of speakers at the WORD event, and each speaker featured an individual from the book, giving the audience a summary of their whakapapa and life. Others spoken about on the day were Amiria Puhirere – a stunning figure standing in her full-length korowai in the photo on page 86, she was a prominent leader and renowned weaver who lived at Ōnukū on the Akaroa Harbour; Trevor Hapi Howse – a major part of the research team that led the long work for Ngāi Tahu Te Kerēme/the Ngāi Tahu Waitangi Claim and a key figure in the Kā Huru Manu project; and William Te Paro Spencer – a seafaring kaumātua and muttonbirder, described as “proudly and strongly Ngāi Tahu” and “very much a Bluff local but wordly with it”. 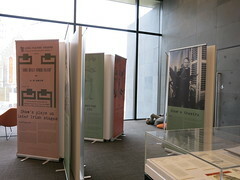 As mentioned above, one of the strong features of the book are the photographs, many of which are from iwi archives and other private collections, and often have not been published or displayed outside the embrace of whānau before. It is clear that it is something special these photos are being shared not only with iwi whānui but with the whole country, and such a personal act of whakawhanaungatanga is to be valued and cherished. 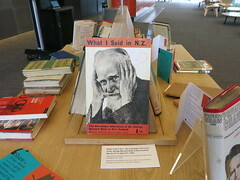 Although the prime audience for the book is Ngāi Tahu tāngata there has been huge interest in it since media company The Spinoff published an article about Mere Harper, who helped setup the Plunket organisation. 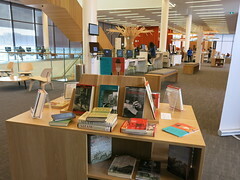 The audience has since become national and international, with a strong focus on the book’s contribution to the historical narrative of Aotearoa. Read a book review of Tāngata Ngāi Tahu. 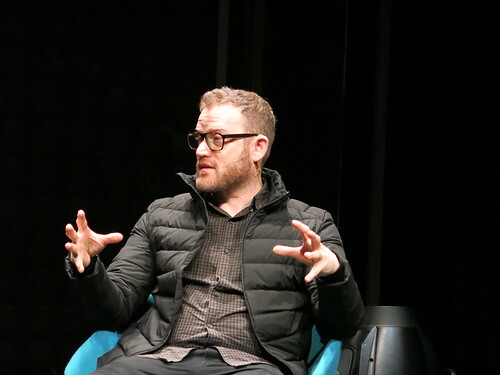 The appearance of Mr John Safran in Christchurch managed to pack out The Piano venue on Sunday with a fair audience. He was matched with NZ’s very own version of himself, Te Radar Esq., who pointed out that although they both looked very similar, you could easily tell them apart as John was the one with the accent. Unless of course you were from Australia, in which case Te Radar was the one with the accent. Simple really. Yet simple John’s new book Depends What You Mean by Extremist: Going Rogue With Australian Deplorables is not. In fact it might be claimed that one reason for writing the book was because most other media didn’t like the tangled web of stories John had discovered in his very own Aussie backyard. What he’d found happening in the world of political radicals was not easily reduced by the popular media spotlight to black vs white, or local vs outsiders. There are many reasons people are in involved in anti-Islam rallies, and it’s not always politics. John has found a very diverse range of cultures and people marching for the reclaim Australia and anti-Islam causes, some of them strange and unexpected bedfellows. An anti-immigrant campaigner with Aboriginal and Italian lineage hanging with white nationalists, a Sri Lankan pastor opposing multiculturalism, and leaders of anti-immigrant rallies opening their speeches by acknowledging the land they were standing on as belonging to the Aboriginal community. Some have claimed the lack of media interest in John’s stories proves the “bubble” caused by social media and the internet is real, the so-called echo chamber where we only pay attention to things and ideas that meet our world-view and beliefs. Yet people have always filtered news and read newspapers and magazines selectively. We read what attracts our interest and reading things that don’t fit our understanding of the world can be challenging, so often we don’t. The internet hasn’t created that effect, it’s just made it quicker and easier to achieve – such is the way of computers. The world changed as I was writing the book. The anti-Islam street movement tried to portray the rallies as ‘normal’ not extreme, but I found they were led by some very extreme people. It was like the fringe and alternative had become mainstream or at least mingled up with the mainstream. Te Radar asked John if he’d become less optimistic about the world as a result of writing the book? John’s response was that he had definitely got a bit paranoid hanging around with extreme people. Ironically he thought that getting out on the streets got him out of the echo chamber that the average person might inhabit. I can’t moralise about anything ‘cos I’ve always done something in the past I shouldn’t. But I don’t think people read my book and think the things these groups are saying and doing are ok.
A few questions from the audience stirred things up, with a bit of heckling that just came across as try-hard or even embarrassing. Mostly it was all very civilised and well-behaved. I don’t go to a lot of these events, so maybe that’s normal in Christchurch. I’ve enjoyed reading the book and it’s definitely an eye opener. And thanks to John seeing the irony in much of what he saw happening, very funny too, although perhaps more in a gallows humour way. John Safran’s ability to just rock up somewhere Louis Theroux styles and ask people the questions going begging, without being beaten to a pulp, continues to amaze me. An audience member shared the story of the New York commuters cleaning anti-Semitic graffiti from the walls of a train with hand sanitser, and John himself thought that the antidote to all this extremism is just to expose these people to the world. All of which made me think that maybe John Safran is using humour to wake us up to the way people under our very noses think about the world. Does this make him the comedic hand sanitizer of the Aussie extremist world?